Carnivals were festive events dating back to Roman times. In spite of their pagan origins, carnivals have also been adopted into the Christian calendar. Literally speaking this refers to a farewell to meat festival, which is followed by the fasting period before Easter, which we now know as Lent. In addition to eating and drinking, masquerading, all kinds of frivolity and jokes at the expense of persons unknown, dancing, performances and other programmes both among the populace and the upper echelons, mocking authority under the protection of anonymity, etc. were a part of carnivals, even from the beginning of our chronology. In Venice, the carnival tradition was in full flourish way back in the Middle Ages. Festive and dance structures were set up in St. Mark’s square. Splendid decorated gondola processions were organised along the Grand Canal. Masquerading and disguises made sexual equality possible for the duration of the carnival, irrespective of age and social position. Commedia dell’arte masks became popular, especially that of Pantalone, the long-nosed doctor who originated in Venice, as well as other characters. Papier-mâché began to replace leather as mask material. 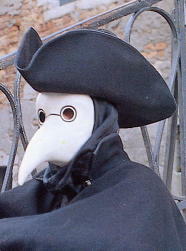 However, the Venetian black or white half­mask known as a bauta, to which a black hooded cloak and cocked hat were added, enjoyed special status. During the carnival, which lasted over a week, anyone was allowed to wear a bauta. At other times this was a privilege reserved exclusively for the nobility. Moretta was a round mask covered with black velvet and used by women. It was held on the face with a little mouth piece placed behind the mask. Thus the wearers of the moretta appeared as silent figures in the midst of the carnival rumble. In Venice, laws regulated the wearing of carnival masks and costumes. Wearing a mask was much more liberal for the nobility than for members of the lower ranks of society. Masquerading outside the carnival period resulted in a peculiar decadent moral atmosphere among the nobility, which enabled private matters to be dealt with in secret, without others knowing. Many well-known l8th century figures such as Casanova, Mozart, Goethe and countless European monarchs spent their time or stayed for long periods in Venice and its scintillating mysterious world. At the end of the century, Napoleon conquered northern Italy and prohibited the wearing of masks. The centuries old tradition of masks was over. During the first half of the 2Oth century the carnival activities were stopped until they were revived in the 1980s. Nowadays, the Venetian carnival is probably very different in character. Social and religious limitations are now less restrictive, which means people can also have fun without the need to hide behind a mask. The return of the mask, however, has restored something fundamental to Venetian life.